Royal Doulton Carnation Milk Jug & Lidded Sugar Bowl. Milk jug stands 12cm to spout and the sugar bowl 8cm to rim both in very good condition. 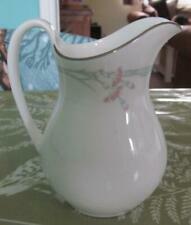 ROYAL DOULTON CARNATION MILK JUG FOR TEA SET. ITEM SHOWS ROYAL DOULTON BACKSTAMP. THE JUG STANDS 4 5/8" HIGH TO THE TIP OF THE POURER. BRIGHT GILDING, CLEAN INSIDE AND OUT. 6 13.5CM FRUIT/DESSERT BOWLS,VERY GOOD UNUSED CONDITION ,FIRST QUALITY. Here is a milk jug and lidded sugar bowl in the classic Carnation pattern from Royal Doulton. They are 1st condition. The jug is 4.5" tall at the spout, the bowl is 4" tall with the lid in place. They have had very light use, if any. Two Royal Doulton fine bone china napkin rings in the delicate Carnation pattern. Royal Doulton Carnation Pattern H5084, this Pattern was produced between 1983 until 1998 and is now discontinued. 1st Quality. Here is a small cream jug and sugar bowl in the classic Carnation pattern from Royal Doulton, designed to suit a coffee set. They are 1st condition. The jug is 4" tall at the spout, the bowl is 2" tall. Cup Saucer & Plate. - £2 could buy plenty of bubbles for a lovely warm, cosy whirlpool experience for a child. 21 x Piece Royal Doulton Carnation HN.5084 Coffee Set (1st). new in box royal doulton carnation salt & pepper pot. Dispatched with Royal Mail 2nd Class. 1st Quality. In As New Unused Condition. Quality China At The Right Price! 18 December. - £2 could buy plenty of bubbles for a lovely warm, cosy whirlpool experience for a child. Royal Doulton Carnation 2 x soup / cereal bowls. 1st quality and never actually been used. Stored in a cupboard for years so mint condition. Measure approx 7”wide. HERE I HAVE A SET OF 10 ROYAL DOULTON CARNATION BONE CHINA DINING PLATES. PRICE IS FOR ALL 10 PLATES. Royal Doulton CARNATION H.5084 Salt & Pepper Pots. Here are 4 side plates in the classic Carnation pattern from Royal Doulton. If you want 4 plates choose the quantity of 1, if you want all 8 plates choose the quantity of 2. These pieces have been lightly used so on close inspection may show light cutlery scratches. 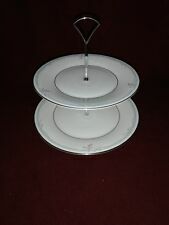 2 Pairs of NEW Unused Royal Doulton Carnation H5804 Tea Cups and Saucers 6 1/8"
From a smoke free household. Manufacturer:Royal Doulton. Item:Sugar Bowl - Open (Tea). White with delicate Carnation pattern (Pattern Reference H5084). Royal Doulton. Fine Bone China. GRAVY/SAUCE BOAT IN EXCELLENT UNUSED CONDITION. HERE I HAVE A SET OF 6 BEAUTIFUL LOVELY ROYAL DOULTON BOWLS IN THE CARNATION PATTERN/STYLE. PRICE IS FOR ALL 6 BOWLS. CARNATION Royal Doulton? Fine Bone China, Made in Staffordshire England. Dispatched with Royal Mail 2nd Class. A fantastic set of 6 Royal Doulton Dinner Plates in the popular 'Carnation' design, pattern H 5084. 27cm diameter and made from English Fine Bone China. One plate has some scratches in the centre as seen in the last image. Others have some very slight wear to the silver rim from light and infrequent use. Dispatched with Royal Mail 2nd Class Signed For. For any further information or photos please contact me. Other items in this design also available, please see my other listings. Happy to bundle postage for more than one purchase. Pattern H5084 Carnation pattern decoration on outside is pale bluey grey with pale pink carnations and rim is edged with silver colour. Royal Doulton. One very pretty unused Fine Bone China 2 handled bowl intended for soup but could be used as two handled cup for drinking chocolate etc. Royal Doulton base mark. The Sugar Bowl is in very good bright condition. special size boxes, the real killer is parcel tape! obtained for everything so if there are any delays. Item Weight: 110g. Royal Doulton Carnation 2 x salad / dessert plates. This is the larger 9” version. 1st quality I was told they were only used once and they are in superb condition. Stored in a cupboard for years. Measure approx 9”wide. NEW - never been used - perfect condition. Rare Carnation Pattern D6419. 18 December. 20 December. Manufacturer:Royal Doulton. Item:Sauce Boat Stand. Royal Doulton Carnation Pattern H5084, thus pattern was produced between 1983 until 1998 and is now discontinued. 1st Quality. 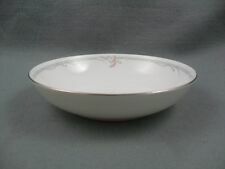 Royal Doulton - Carnation - 1 x 8" Plate with microwave safe trim - UNUSED? Royal Doulton CARNATION. Soup / Cereal Bowl. Diameter 7 inches. Royal Doulton CARNATION SIDE TEA PLATE 16.5cm H5084.